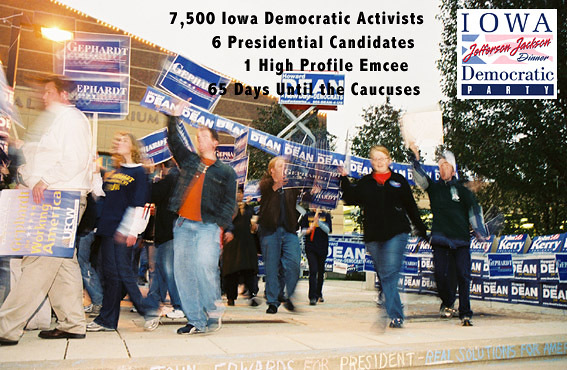 The Iowa Democratic Party's Jefferson-Jackson Day Dinner in Des Moines on November 15, 2003 drew six of the Democratic presidential candidates. 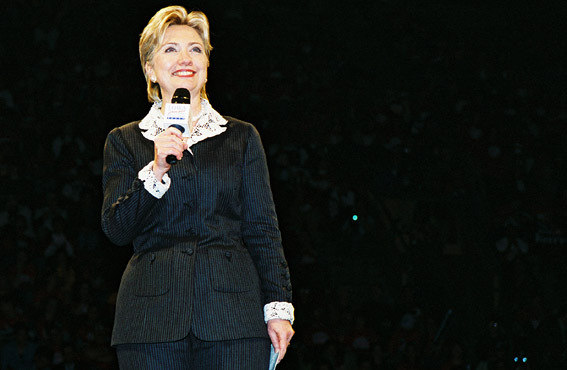 Sen. Hillary Rodham Clinton, who emceed, was the biggest draw of the evening, but she is not a candidate, in 2004 at least. The major campaigns mobilized for an all-out show of strength. Before the dinner, some of candidates held rallies to fire up their supporters. Meanwhile, outside Veteran's Memorial Auditorium the campaigns' engaged in sign war which ended in a draw, with hundreds of signs on lawns, in bushes, and on fences. Once inside, attendees could stop at information tables in the lobby area as they made their way past more signs. In the hall itself, cheering sections revved up in advance of the speechifying, while couple of remote controlled blimps moved lazily overhead. After the speeches, the candidates and local political leaders all gathered on stage. Finally, there were post-dinner parties and events. Several of the candidates stayed on to do further campaigning in the state.